Posted on September 30, 2013 at 4:32 pm. Netflix is one of those brands I believe in. Having been a Netflix subscriber for just over 10 years now, it was a welcome change to have rental movies sent right to the house instead of fighting over what’s left on the Blockbuster video shelf. Elbowing old ladies for the last copy of Titanic is no longer necessary in this day and age. Ah, the good ol’ days. I have developed different ways of tackling projects. Different styles of art require their own unique approach. 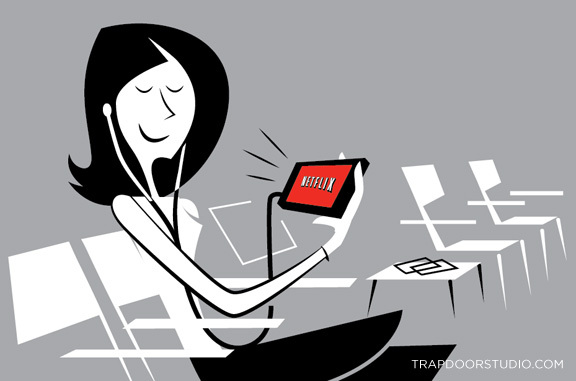 All of this art was created to make their signature Netflix red stand out and draw your eye. I enjoy playing with negative space, so using a limited color set worked out nicely and kept the focus on red. Limited color also played well considering my quick deadline for this project. A set of information graphics designed to streamline user understanding of just how easy it is to get started. Carved out space for copy on most of these. The viewing hardware had to be correctly represented, X-box, Roku and others. They wanted consumers to see their own device. Always many details to consider when working on a project like this. Thankfully, Paul from Dragonfly Design Group was great to work with and the process went smoothly. Spelling it out for you. Download, sign-in and go! 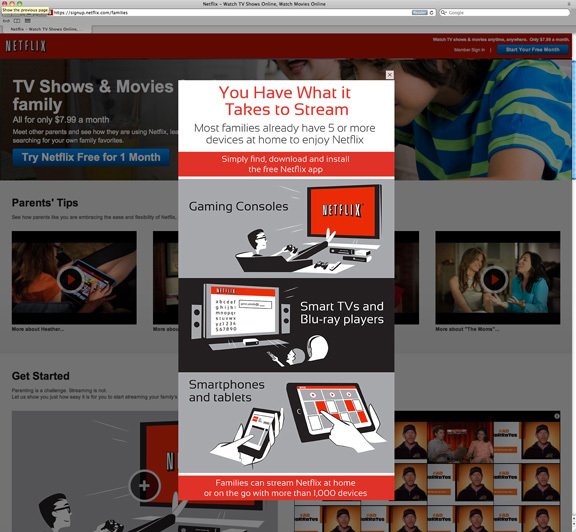 Here’s a screen capture of how these illustrations displayed, and a link to my work on the Netflix Families page. Enjoying some downtime while on a business trip. Waiting around at the DMV. A gigantic shout out to Paul Rickey and everyone at Dragonfly Design Group in Burbank, Ca. for collaborating on this terribly cool project. If you like this article, here’s a few more you might enjoy. Sweetish Fin, Wrap it up, The Modern Quail. Jon — great working with you on Netflix and other stuff. It’s S W E E E E T to collaborate on a professioal plateau. We’re going to have to commision you to help tweak our Dragonfly graphic ID. Catch you sooner than later.